I remember the moment I fell in love with marine animals. I was ten years old, visiting Sea World in San Diego with my family, when I saw two scuba divers swimming in a tank of dolphins. That’s all it took. 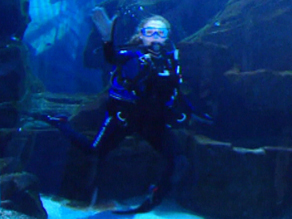 Waving to aquarium visitors through the glass at the Ocean Voyager exhibit. Fast forward twelve years. A degree in marine biology and a few marine science internships later, I’m still that same 10 year-old redhead who gets giddy every time I see a scuba diver in an aquarium. So imagine my excitement last week when I found out that I was going to scuba dive in the world’s largest aquarium with the world’s largest sharks. Everyone jokes that they are going to throw their interns to the sharks, but the CNN Science and Technology producers weren’t kidding. Turns out the Georgia Aquarium had offered me a once in a lifetime chance to swim with whale sharks, rays, and the thousands of other fish in their football field sized Ocean Voyager tank. It’s all part of their new Swim With Gentle Giants program that lets the public scuba dive with these majestic animals one half hour at a time. I couldn’t pull on my wetsuit on fast enough. Before I climbed down the ladder into the 6.3 million gallon tank, people kept asking me if I was scared of what I was about to do. Truth was, I was more nervous that I wasn’t going to remember how to scuba dive than to look blacktip reef sharks in the eye. Sharks have very slow metabolisms so they don’t need to eat often. Like baleen whales, whale sharks are filter feeders, meaning they would be more interested in plankton than me. I wasn’t even frightened of the other sharks in the tank. Thanks to a hardworking aquarium team, they are fed regularly enough to keep their stomachs happy and most of them don’t find the taste of humans appealing anyway. 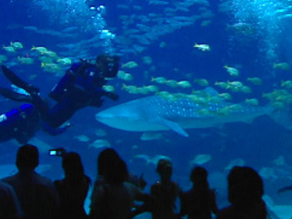 One of the Georgia Aquarium’s whale sharks swims gently by divers. So there I was, swimming through schools of French grunts, kneeling next to cownose rays, and coming face to face with giant grouper. All the while, the white underbellies of the four juvenile whale sharks slid silently by above our heads. It was only after the hammerhead shark came within one foot of me that I remembered I was trespassing on their turf. But they didn’t seem to mind. Millions of people visit the Georgia Aquarium each year, and, like me, this will the closest they will ever come to whale sharks in their lives. And that’s exactly what the aquarium wants. These four whale sharks are ambassadors for their species. Gently swimming through their giant aquarium habitat everyday, they are not only educating the public on the beauty of their species but also the threats to their population. Like most shark species, whale shark populations in the wild are a fraction of their historic levels. So the next time you get nervous about swimming in the ocean because you think sharks may be roaming in the deep blue water, remember they are treasures of nature not monsters of the deep. (Note to my producers: you can throw me to these sharks any day). For more information on the Ocean Voyager exhibit and the Swim With Gentle Giants program, please visit Georgia Aquarium website at http://www.georgiaaquarium.org.